The Denver Film Festival is wrapping up this weekend and I just got home from seeing a brilliantly cut documentary call ”Quantum Hoops”. 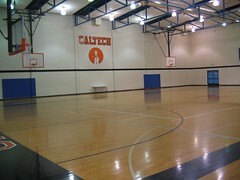 If you didn’t know, CalTech actually has a basketball team and is on a 22 year conference losing streak. Yeah, that’s right, I said, TWENTY-TWO YEARS! This film is about that team. I asked Rick how CalTech was responding to the film. He said that one of the Noble Prize winning Profs at CalTech, after watching the film said it gave him such hope and inspiration to teach, that he slept peacefully because he saw that all these gifted, awkward, extraordinary genius students in his classes had a place in the real world. Go watch ”Real Genius”, that Val Kilmer cult classic, to get an idea of just how awkward CalTech kids are. That film was actually based on the school. I knew a CalTech genius that went on to do his PhD at Rice University in some kind of Math that hurts my brain to pronounce. He was quintessential nerdsville, and wookie-like in hair-mass, but one of the more tolerant loving guys I’ve known. Once again it is nice to see good art in action that not only is created excellent, but communicates a new perspective on a redemptive reality.